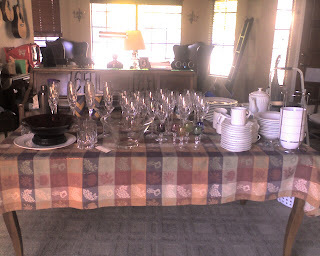 Even though almost nobody ever comes to our house to celebrate anything anymore, I'm still emptying out the hutch for dust-removal and spot-checking, polishing my silver (both pieces of it), and giving the "entertaining" side of the Den a thorough dusting, wall-washing, organizing and so forth. I can't explain why I'm doing this. Thanksgiving this year is just us and (probably) one of our close friends and his son - who would actually be made squirmy if I went all Martha on them. Christmas dinner will undoubtedly be held at my brother's condo complex clubhouse on paper plates, or not at all. I'm working New Year's Eve day, so no action there, either. And yet...the season is here. And thus, I prepare for parties that aren't happening, gatherings that will be elsewhere, and dude...it's really rather pathetic, ain't it? How about... it's okay to clean and organize your house for yourself? You deserve it, you know! The wine cabinet may need some personal attention, just so it's not lonely. Where's the wine opener?